WHAT ARE THE DIFFERENCES BETWEEN SINGLE AND DUAL VOICE COIL SUBWOOFERS? You’re shopping for subwoofers and you see two identical looking woofers. You read the specifications on the label and notice they are the same for both car subwoofers. The price is slightly different and the model numbers are slightly different, but everything else is the same! But wait, you turn them over and one says “Single 4 Ohm” and the other says “Dual 4 Ohm”. This is no deception, your eyes don’t lie. Before you bag one up and take it home, do you know the difference between a Single and Dual voice coil subwoofer? First of all, what is a voice coil? The voice coil in a subwoofer is a coil of wire wrapped around a cylinder called the former, which accepts the amplifiers current. Current from the amplifier causes the coil to react with the stationary magnet, moving the former up or down. The former is attached to the speaker cone which produces changes in air pressure when moved, producing sound. A single voice coil (SCV) is one length of wire wrapped around the former. A dual voice coil (DVC) has 2 coils of wire wrapped around the former. A single voice coil subwoofer will have a positive and negative terminal, while a dual voice coil subwoofer will have 2 positive and 2 negative terminals, one for each coil. The price of a DVC subwoofer will usually be slightly higher than its SVC brethren due to the extra coil. There is no performance advantage between the two types of voice coils, so why bother? The advantage of a DVC subwoofer over the SVC subwoofer is your available wiring options and flexibility. 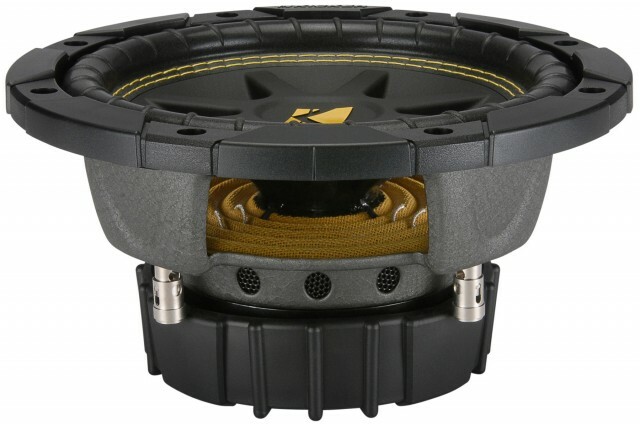 Single voice coil subwoofers can only be wired at the ohm level specified, for example 4 ohm. A dual voice coil will say 4 ohm, but it will actually wire to 2 ohm or 8 ohm. That last sentence alone tends to blow the minds of many, you are not alone. The ohm level needs to match up with the ohm level your amplifier can handle. A DVC woofer has 2 wiring options while the SVC has only one option. When everything is all said and done, the only real difference between a single and dual voice coil subwoofer is the number of coils, which means a greater wiring flexibility. The power handling, frequency response, box volume specifications, etc. will remain the same for both types of woofers (except in rare cases). Feel free to use the Sonic Electronix subwoofer wiring diagram to help you configure the right subwoofers.